Twenty people have been killed and another 200 injured on Friday after tens of thousands of demonstrators hit the streets to protest against an anti-Islam film. Police fired teargas and live ammunition to disperse rioters. At least 17 of the deaths happened in the city of Karachi. The combined total of the wounded in Karachi, Peshawar, and Islamabad was 195 people, according to AFP. The government declared Friday a public holiday, named “The Day of Love." The holiday was created specifically so people could peacefully rally against the video. However, the protests quickly turned violent in multiple cities throughout the country. 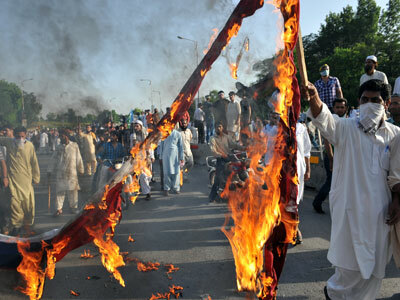 Protesters have taken to the streets in Islamabad, Karachi, Peshawar, Rawalpindi, and Lahore. In Peshawar, a driver for a Pakistani television station was killed when police bullets hit his vehicle at the scene. A protester was also shot and killed during a separate demonstration in the city, according to AP. Several hundred protesters set two cinemas and the city’s chamber of commerce on fire, and damaged shops and vehicles. Police used batons to repel the demonstrators. Later in the day, tens of thousands of protesters gathered in one of the city’s neighborhoods calling for the maker of the film to be executed. Twelve people have died in the city of Karachi. Armed protesters fired on police, killing one officer and wounding another. Members of the same group set fire to two cinemas and a bank, according to AP. 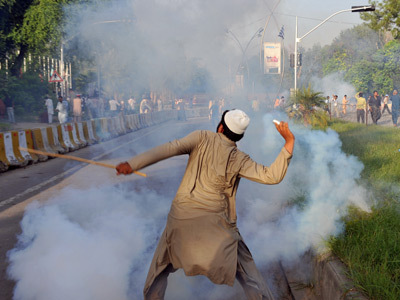 In the country’s capital, Islamabad, which saw violent clashes between protesters and officers on Thursday, protesters burned a police check post and breached the “Red Zone,” where the US embassy is located. RT correspondent Paula Slier reports there is a standoff between police and protesters trying to reach the US embassy in Islamabad, and that the army has been called in. Throngs are pelting stones at officers, who in turn teargas them as they attempt to storm the embassy. “What we’re witnessing is the spark to the fire that is seeing tens of thousands of people take to the streets in these cities to hold the US responsible for what they say is the worst attack ever on Islam,” Slier said. 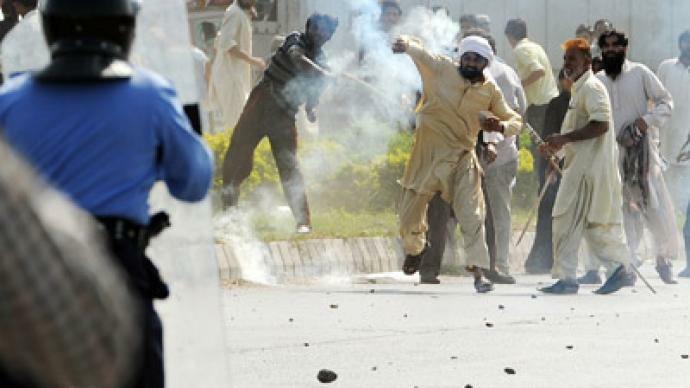 Police also fired teargas on demonstrators in Islamabad and Lahore in an attempt to keep them from advancing toward US missions in the cities. In an effort to curb the protests and respond to safety concerns, the government has closed numerous shops, markets, and petrol stations throughout the country. The film has generated unrest in the Muslim world over the past 10 days, and led to the deaths of at over 40 people. 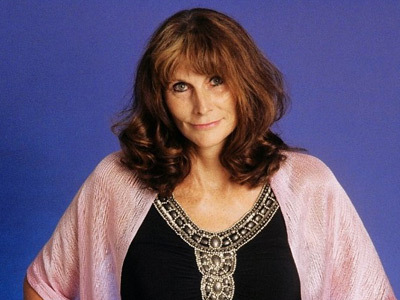 Most of the anger has been directed at the US government, although the movie was independently directed and produced. The US State Department is airing a message on Pakistani television channels which shows President Obama and Secretary of State Hillary Clinton denouncing the film, in an effort to defuse anti-American sentiment. The US embassy in Islamabad produced the ad from public comments by Obama and Clinton, and the State Department spent about $70,000 to buy commercial time to show it, department spokeswoman Victoria Nuland said in a statement. Recent caricatures of the Prophet Mohammed, published by French magazine Charlie Hedbo, have added fuel to the fire by sparking even more anger across the Muslim world. Two of the drawings showed the Prophet naked. French Interior Minister Manuel Valls stated that France will not allow street protests against the cartoons. Regions throughout the country have been given orders to prohibit demonstrations and crackdown if the ban is challenged. “There will be strictly no exceptions. Demonstrations will be banned and broken up,” Valls told a news conference. Police are on high alert in Paris after protests planned by some Muslim groups were banned. France has closed its embassies and other official offices in 20 countries in Islam-professing countries. French Muslim leaders condemned the magazine and said a request for calm would be read in mosques across the country on Friday. Pakistan is not the only country which saw demonstrations on Friday. Citizens of several other Muslim countries took to the streets in protest. In the Sri Lankan capital of Colombo, about 2,000 Muslims burned effigies of President Barack Obama and American flags, demanding the US ban the film. In Bangladesh, over 2,000 people marched through the streets of Dhaka, burning a makeshift coffin draped in an American flag and an effigy of Obama. 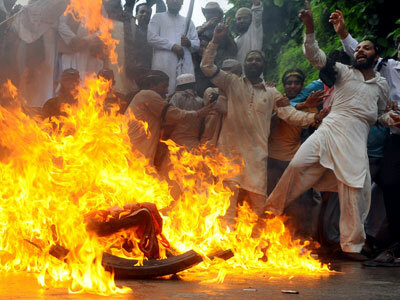 They also burned a French flag to protest against the caricatures of Mohammed. Protesters have also gathered in Tunisia and Lebanon as the protests close in on their 10th day.